If you are a Martial Arts Instructor or an experienced Martial Artist with several years training, regardless of style, and are interested in becoming certified to teach the Filipino Martial Art of Lightning Scientific Kali, we have opened an Instructor Training Program available in NYC and NJ. If you are located outside the tri-state area, we may be able to travel to your location to provide you with regular private / semi-private training. 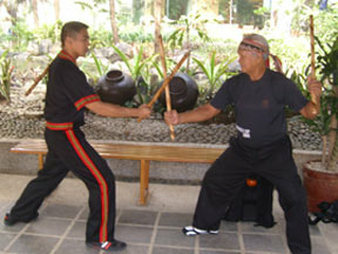 This program covers single stick, double stick, stick and dagger, and empty hand defense against weapons. This is a quality intensive personal training program for experienced martial artists who are serious about expanding their knowledge of the Filipino Martial Arts. It is not a quick overnight or seminar style certification course. There are three levels of Trainer certifications in our system. You will be authorized to start an official Lightning Scientific Kali class when you have completed the Level 1 Trainers certification. Each level of certification takes 16hrs intensive private / semi-private training to complete. Level 1 Trainer certification: Upon completion of this course you will be certified to teach our Basic curriculum. Level 2 Trainer certification: Upon completion of this course you will be certified to teach our Intermediate curriculum. Level 3 - Advanced Trainer certification: Upon completion of this course you will be certified to teach our Advanced curriculum. Filipino Kali Escrima in Manhattan, NYC, New York (NY), New Jersey (NJ), Colorado (CO), Maine (ME), California (CA), and Tokyo (TY), Japan.